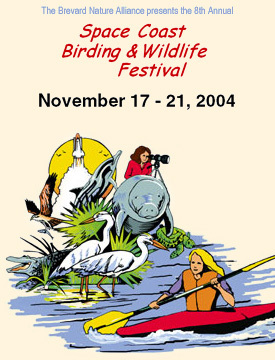 The Space Coast Birding & Wildlife Festival was created in 1997 to showcase the unique nature, wildlife, and technology in Brevard County. With a comprehensive schedule from sunrise to sunset, participants can explore all our county has to offer while enjoying time with families and friends. Now in its eighth year, the festival, has grown to become one of the top three premier environmental events in the United States. This major accomplishment would not have been possible without the support of the Brevard County Tourism Development Council, Visit Florida, corporate and organization sponsors and partners, volunteers (speakers, presenters and task performers) and the attendees who participate. The festival is important because it generates awareness of the abundant natural resources of our area, not just during the event, but also throughout the entire year. The connection of these natural resources to quality of life, excellence in environmental education, high technology and business community involvement provides a focus that has placed the festival as being 3rd in ranking of birding and wildlife events in the United States as well as being recognized internationally as an event destination for premier birding opportunities and outdoor adventures. The commitment to create an opportunity for education, environmental and conservation experiences, space, nature and wildlife enjoyment, and birding appreciation has brought many organizations together to present a safe, memorable and fun event. The Brevard Nature Alliance, Titusville Area Chamber of Commerce, Brevard Community College, Merritt Island National Wildlife Refuge, Canaveral National Seashore, Space Coast Audubon Society, City of Titusville, Brevard County Tourism Development Council, and Kennedy Space Center Visitors Complex as well as many loyal continuing Sponsors and volunteers have all contributed toward a concerted effort to provide a unique atmosphere for the participants in the Annual Space Coast Birding & Wildlife Festival. 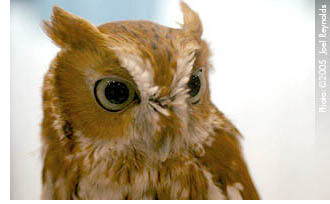 When a small group of volunteers met eight years ago to plan the concept of this event, the use of science and technology to benefit wildlife emerged as a central theme. We’ve witnessed history being made as the whooping crane reintroduction projects, begun nearly 23 years ago, produced the first whooping crane chick to fledge in the wild in the U.S. in 63 years – a new member of the non-migratory flock of Central Florida whoopers. As the 2004 festival took place, another flock of juvenile whoopers flew behind an ultra-light aircraft as it headed to Florida, memorizing a migratory route that will be passed along to future generations of the eastern U.S. flock of migratory whooping cranes. We were honored to have had in our midst this year, members of the visionary team that brought that magnificent bird back from the brink of extinction. We were also honored to welcome members of the Whooping Crane Conservation Association, who selected our birding festival as the location for their 2004 annual meeting. This project is just one example of the amazing undertakings featured at the festival; The list is long and the collection of presenters and field trip leaders a virtual who’s who within the environmental community. Many of them return every year, volunteering their time because they are passionate about their work and its impact on the future. They understand the value of education and its ability to introduce change. Through learning and experience, residents and visitors alike grow to appreciate and ultimately work to protect what makes Florida so unique and special. We are humbly grateful to each of them for investing their own time to help to educate about our home community as well as other areas around the world. The Festival Program/Outdoor Adventure Guide is a publication that is used year long to help lure visitors to the Space Coast – the gateway to discovery – as well as to other areas of East Central Florida. This publication is the only known one within the State of Florida that promotes a plethora of activities from which the prospective visitor can choose and includes a listing of current outdoor adventure providers as well as area attractions, museums, and nature parks. Requests have come from other states that wish to use this publication as a guide to develop their own that will promote their events and outdoor activities. The Space Coast is blessed with a wealth of natural, historical, and cultural resources, outstanding quality of life, and an ideal setting for educational opportunities. Our goal is that, through education, residents and visitors alike will grow to appreciate and ultimately want to protect the treasures we are so fortunate to have. The Brevard Nature Alliance is a group of individuals and organizations associated for the purpose of raising the awareness of citizens and visitors to the value and importance of the natural resources of Brevard County, Florida. We are dedicated to serving our community through educational outreach, environmental program development, strategic planning, and the sharing of information and expertise with all interested parties.